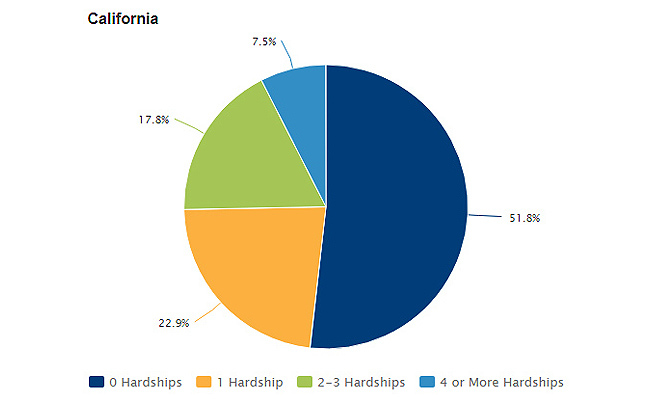 Almost half of women in California who recently gave birth in 2013-2014 had experienced adversity as children. Childhood hardships, including family hunger, parental substance abuse, and basic needs not being met, can influence long term emotional health and impact the next generation. Mothers who had experienced childhood adversity are more likely to have feelings of depression during and immediately after pregnancy, and unaddressed maternal depression can have life-long consequences for their children. According to a data brief (PDF) from the California Department of Public Health, over 25% of women who experienced four or more childhood hardships developed postpartum symptoms compared with 10% of women who did not experience hardships as children. Women who are identified early and receive appropriate treatment, particularly during pregnancy, can mitigate the impact of postpartum depression and engage positively with their child. Children of women who have been identified should have well-child care that carefully monitors their psychological and social development. Family Voices of California is hosting a Kidsdata webinar to focus attention on children with special health care needs. Learn about the types of data that are available and how to access and use them to promote action and optimize children’s health and well being. Wednesday, October 24, 12:00PM – 1:00PM PDT. Register here. This entry was posted on Thursday, October 11th, 2018 at 11:39 am. You can follow any responses to this entry through the RSS 2.0 feed. You can leave a response, or trackback from your own site.